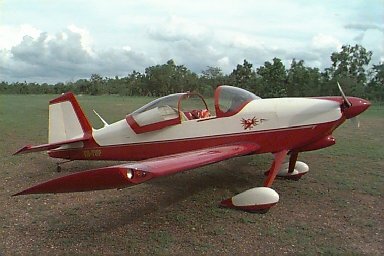 With thanks to Steve McGrath for the Photo's of Trevors RV6. 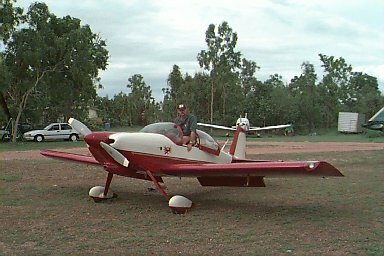 This magnificent looking aircraft was built by Trevor in his Workshop/Hangar in Darwin NT , Trevor has his own business as a Licensed Aircraft Mechanical Engineer and has the support of many local Aviators as being one of the best or The best L.A.M.E. In Darwin . Inside the Cockpit of VH-TUP looks very organized and shows the hand of a real craftsman that knows what he wants in an aircraft. 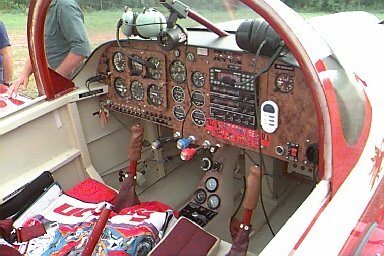 "Two Up" is equipped with a carburetted 180 hp Avco Lycoming engine and a Hartzell Constant Speed Prop. Trev has fitted a long range tank behind the dash and installed a fifth crotch belt to help with any unforeseen turbulence. Typical performance is around 165kts at 2300rpm and 23 inches MAP at an indicated altitude of 8000 feet.